Buy 4 or more cups and receive $10.00 off your order. Valid on Tervis.com and in Tervis stores.This offer may not be applied to previous purchases and is not available on wholesale or corporate orders. Applies to Tervis drinkware products only. Gift sets count as one product. Excludes 3rd party branded products. May not be combined with other offers. Subject to change without notice. Enjoy $10 off a future order when you refer a friend to tervis.com. Your friend will receive a unique promotion code by email for $10 off their purchase of $40+ at tervis.com. After they have ordered, you will receive a unique promotion code by email for $10 off your purchase of $40+ at tervis.com. Offers not valid on stainless steel, outlet or 3rd party branded products. This offer may not be applied to previous purchases or combined with any other offers or discounts. Not valid on wholesale or corporate orders. Subject to change without notice. Please read all terms and conditions. Some restrictions may apply. First Responders, Military, Government employees, Teachers and Students save 15% on drinkware products and accessories (before taxes and shipping) when you verify your ID.me account at checkout. Applies to Tervis drinkware products and accessories on Tervis.com and in Tervis stores (when you show your affiliation ID). This offer may not be applied to previous purchases or combined with any other offers or discounts. Not valid on wholesale or corporate orders. Subject to change without notice. For any classic 10oz, 16oz, 24oz tumbler or classic 16oz mug added to the cart, add travel or straw lids of any size for only $1.99. Discount is reflected in bag. Excludes all other accessories. This offer may not be applied to previous purchases or combined with any other offers or discounts. Not valid on wholesale or corporate orders. Subject to change without notice. Receive the above percentage off when you enter code BULK at checkout. Offer valid on drinkware products only. Accessories not applicable towards item count. Gift sets of two or more count as one item. Discount taken before tax and shipping. This offer is not available on wholesale or corporate orders. Offers not valid on stainless steel products. May not be combined with other offers or used on previous purchases. Offer valid online only. Subject to change without notice. Sure, we’re still a few days out and a lot of us are still recovering from a house full of friends and relatives, two months of Christmas carols on the radio, unbelievable sales and an even more incredible Christmas dinner. But New Year’s Eve is Monday. And this one is going to sparkle. And shine. And dazzle. Just like our new Shimmer Collection! But before the celebration, you know what you have to do. Out with the old. Break the habits. Make new commitments. Maintain all the great achievements you made this year. Sure, it’s easier to type than do, but it has to start somewhere. And putting it on paper, or in your phone with daily reminders is a great place to start. And now it’s time to celebrate the new you and say goodbye to 2018. Garnish with raspberries or blackberries. 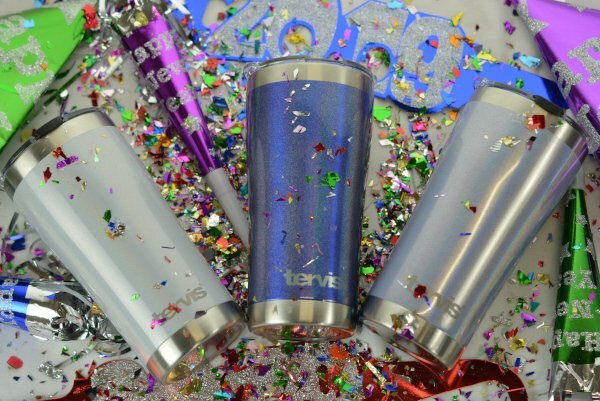 Serve (in dazzling Tervis tumblers) in time to ring in 2019. And please remember to celebrate responsibly. But, if by chance, you overdue it a bit, call a ride share service. Or a cab (just think of it as being chauffeured around town in a yellow limo).